Why do we love Volvos so much? The first reason would be the company’s commitment to occupant safety and structural rigidity. Older Volvos were boxy for a reason: strong roofs, built-in crumple zones, and durable materials were made to ensure that anyone who rode in one will walk away from an accident in one. You might even agree with someone who owns a Volvo on philosophical, intellectual, and ideological terms. There is probably a survey somewhere that shows how progressively minded Volvo owners are over other brands. You could do so scientifically…or stereotypically…but, if you go to where progressive folks shop, your thoughts may be confirmed as soon as you pull into the parking lot. If you consider that in the 1990s, Volvo Cars really loved us. They created ads showing a GLBT couple enjoying their station wagon — and their lives. That was very revolutionary for us. We responded by buying their vehicles, new and pre-owned, knowing that someone back at Volvo Cars headquarters really and truly cared about us to advertise to us. Perhaps there is also another stereotype of our region: the Scandinavian heritage of our ancestors that settled toward the headwaters of the great Mississippi River. The emigration of Northern Europeans onto the lands of the Ojibwe and Dakota were different than others that had settled elsewhere in this country. Winters were harsh, but it was in their blood. As a Swedish car company, Volvo would be welcomed by the ancestors of these settlers form the early-to-mid 1800s as a form of pride in their genealogy. Already, there is enough to show why we love Volvos. It was because of these considerations that I tried my best to present a Volvo for review onto Lavender. It took four years to do it, but it is here. Maybe it was apt to have as our first Volvo the sportiest of the line — one of the two best sellers in the brand: the 2015.5 Volvo S60 T6 Drive-E. 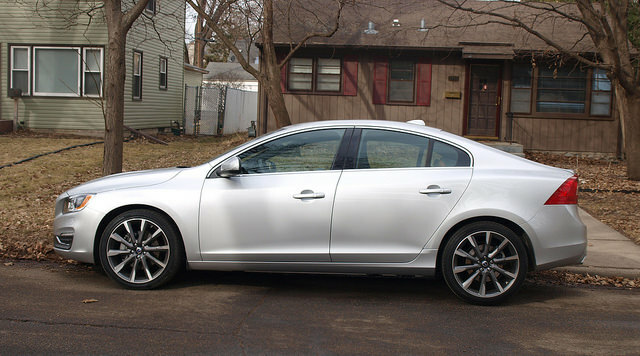 The basic shape of the current S60 has been around since 2010, when it debuted as a 2011 model. It offered a fastback-like shape and some of the most compelling lines ever crafted onto a Volvo. It was intended to compete against the standard bearers in the premium sport sedan segment and had the capacity for high performance models, such as the S60 R and Polestar models. For 2015, Volvo grafted a new look onto the S60 — the “wide mouth.” It extends the grille wider for more presence with redesigned lighting above and on the bumper fascia. It is much more appealing than ever. If the front end does not grab your attention, the side profile will. It speaks to the sporty ones among us. It is that fastback look that makes it stand out in a crowd. There is nothing that blends in, though it has a bit of stealthiness that would surprise unsuspecting enthusiasts of other brands. Add the nineteen-inch alloys for the T6 model and the overall look is truly complete for the premium sports sedan lover in all of us. The silver color outside provides a cover for one of the most alluring upholstery schemes of all time. It is a very soft leather made of brown and saddle hides. They wrap some of the best seats around, perfectly sized and bolstered with big headrests that are active as triggered upon impact. Front seat room is good, though a tall guy like me would find a sporty low position that is still comfortable on longer journeys. Rear seat room is quite small, with lower seat cushions than expected. It is a touring sedan that could seat a family of four just fine. The instrument binnacle is very customizable. A series of switches on the left stalk would set the right menus on the sides of the screen, as well as have you choose between three themes. I found Sport the best with its red background and digital speedometer in the middle of the tachometer. A digital fuel gauge is a static display on the left side regardless of which instrumentation theme you choose. The same background is applied to the screen on top of the center stack. In the center stack is a mix of buttons that control the climate control and Sensus infotainment systems. It may all seem confusing at first, but once you understand each button and control, you would probably use them a few times during the week. The Sensus system itself is extremely comprehensive, especially when the Connect package is on board. Connect has a modem built-in, which needs to be turned on to enable the apps on board. For example, if you use Pandora or TuneIn Radio, you could play either app through the Media menu via the Bluetooth connection with your smartphone. However, if you use the app via Sensus, you could login directly to the car and have full functionality through the system. Redundant switches on the steering wheel for audio controls, along with the cruise control system, are also easy to use once you have their functions down. No matter whether you use an app via Sensus, your phone, or any of the radio and SiriusXM bands, the available Harmon Kardon system offers a fantastic sound from its twelve speakers positioned perfectly around the cabin. In the past, a T6 would mean an in-line six-cylinder engine with a turbocharger and a mountain of grunt. It also meant not-so-great fuel economy from that engine. 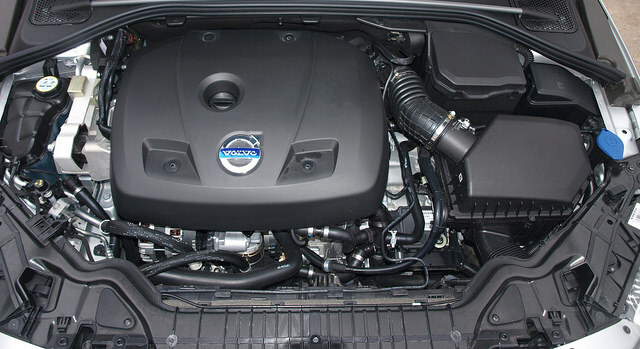 As an update to the 2015 models, known as model year 2015.5, Volvo introduced a brand new family of engines: the Drive-E. Instead of six cylinders, these new engines have only four. It is a 2.0-liter unit that has a double shoot of boost: a turbocharger and a supercharger. Total output is 302 horsepower. Explaining how it works would detract from the experience. There is no lag from either the turbo or the blower. Power is instant, immediate, and effortlessly quick. It’s fast, too — very fast. You do not need an engineering lesson on how the Drive-E T6 engine works. You just have to put your right foot onto the accelerator and take a deep breath. Sending power between this incredible T6 Drive-E engine and the front wheels is an eight-speed Geartronic transmission. Because of the absence of lag, the transmission quickly responds by going through all of the gears quickly. In eighth, it settles the engine down between 1500–1750 RPM at top highway speeds, right where you want it to be. Paddle shifters work well either in Drive or in the Sport setting of the shifter. If you leave them alone, the Geartronic transmission will simply go back to an automatic mode. The gear lever is fine, but I wished I did not have to have a clear cup holder to work it better. The S60 has a smooth ride when the tarmac has nothing to give. Add a few bumps, potholes, and cracks, and the S60’s suspension responds; however, it shows how absorbent the standard suspension can be, when keeping the peace inside the S60. There is nominal roll through the curves and turns. If you attack a curvy road, the S60 responds accordingly and will reward with a drive you never expect form a Volvo. Scratch that thought, you should always expect great handling from a S60. It is an extremely fun car to drive. There is more to that story. Response and reaction from the wheel is fantastic. Though one might find a bit of artificial feel from the wheel, quick turns are done with precision, as are other maneuvers. The wheel does feel a bit soft on-center, but it is not enough to detract from the system as a whole. Braking is good, too. Normal and panic stops are linear and without fade. Stopping power is strong and sharp, and the ABS comes on quickly when prompted. Active safety is what a Volvo is all about. 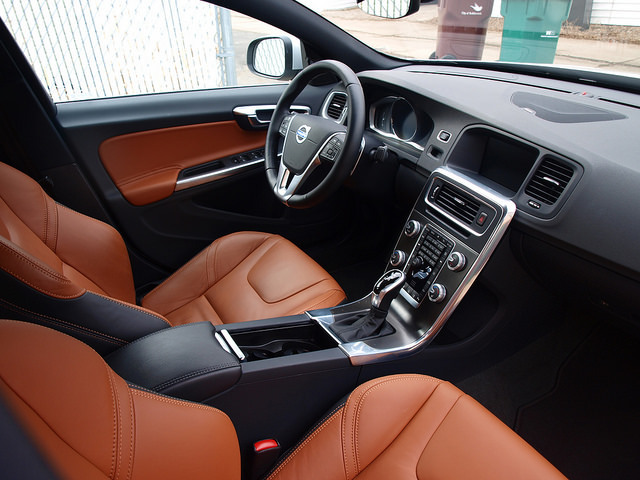 This S60 T6 had the full suite of equipment designed to keep you safe, from active cruise control, lane keeping aid, pedestrian and cyclist detection with full auto brake, collision warning, distance alert, driver alert control, and road sign information. It looks sporty and sleek, but it is still one of the safest cars sold in the USA. The ultimate result of this new engine would be in fuel consumption. The front-drive T6 Drive-E model turned an amazing 29.9MPG average. That…from a 302 horsepower turbocharged and supercharged engine?! Seriously, the numbers did not lie in this case. Pricing starts at $33,950 for a 2.0-liter turbocharged Drive-E T5 model with front-wheel drive. The T6 Drive-E model sampled here with a few extra packages came with a sticker price of $47,575. 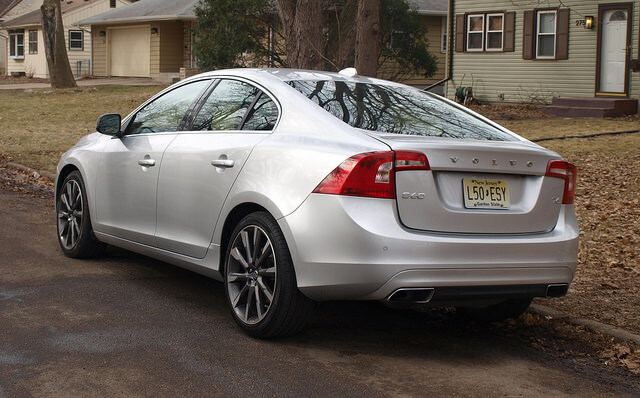 Yes, we tend to go for wagons and SUVs with the Volvo name before looking at the S60. They are indeed practical; some models branded as Cross Country also mean they can be driven away from paved roads. However, the S60 offers a different kind of driving experience that a few people might not be aware of. In other words, Volvos can also be sporty and fun to drive. That is exactly what the S60 T6 Drive-E is all about. It elevates Volvo to new performance and efficiency levels. With the new engine technology, Volvo should never be judged on being solely a safe vehicle with nothing else to show for it. 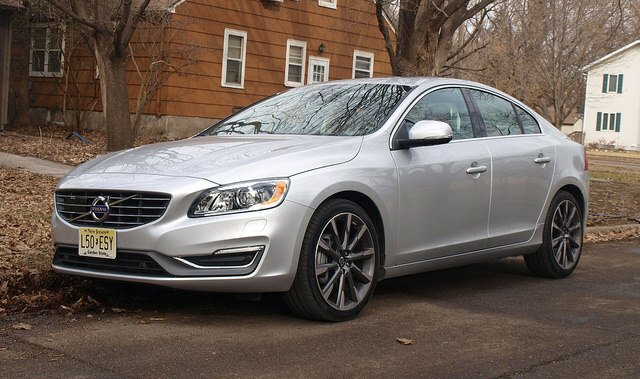 Include the S60’s sporty styling, and consider the Volvo complete. As much as I would rather reminisce about the great Volvos of the past and the socio-economic-political-intellectual history of them, there is one thing that stands out about today’s S60. Just a quick turn in this fast, fun car will make you forget about the past.